My husband, Mark, makes a killer mac and cheese. When we’re invited to a party and we’re asked to bring a dish, I often volunteer him to make it so when I heard about Mac and Cheese Mania at Rachel Cooks and Nutmeg Nanny sponsored by Door to Door Organics and OXO, I just had to add this recipe! This is NOT a low fat or low cal recipe. Consider yourself warned. Mark’s favorite dinner is lamb chops served with macaroni & cheese and a side of stewed tomatoes. Preheat oven to 350F. In a large pot, bring generously salted water to a boil. I grate the cheese while I wait for the water to boil. 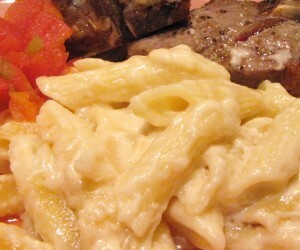 Add the penne. While the penne is cooking make your cheese sauce. Melt the butter, add flour and stir until light golden brown. Slowly add the milk – stirring the whole time. As the sauce begins to thicken add the cheese and mustard. 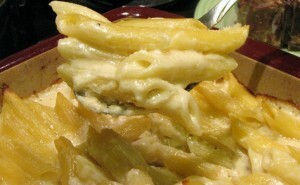 Check your penne and cook until just al dente. Drain and then add back to pot. Add the cheese sauce. When blended, add the sour cream. Pour into buttered casserole and bake, uncovered, for about 40 minutes. If you like alfredo sauce, you will love this mac and cheese.